Most famous nowadays as the venue for royal weddings - including the marriage of Prince William and Catherine Middleton in 2011 - Westminster Abbey is also both the coronation and burial site of many a past British monarch. 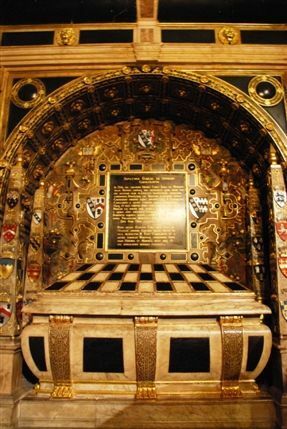 Elizabeth I, Mary I, Mary II, Edward the Confessor, Edward I, Edward III, Edward VI, Henry III, Henry V, Henry VII, James I, George II, Richard II, Charles II and William III are all buried in wonderful Westminster Abbey. And there's some speculation over whether the remains of Edward V (murdered by Richard III?) is among the 17 monarchs who rest here - DNA testing has proved inconclusive. That aside, every one of these royal deaths tells a story and where better to relive it than in this world-famous medieval abbey. The setting for almost every coronation since 1066 - 38 to be precise - the abbey has also formed the burial ground for statesmen, scientists, musicians and poets. Approximately, 3,300 people are said to have been buried in the church, including Chaucer, Sir Isaac Newton, Laurence Olivier and Charles Dickens. Stunning Gothic architecture, the fascinating literary history represented by Poets' Corner, the artistic talent that went into the statues, murals, paintings and tombs and the fantastic stained glass combine to make Westminster Abbey the most enduringly stunning of London's churches and a treasure trove of royal history.